T-shirts for you and for all the nature lovers in your life – WHILE SUPPLIES LAST!! Save $8 when you buy a digital album and t-shirt bundle – $26.99 $18.99 (plus shipping) for the digital album and t-shirt or save $7 when you buy a CD and t-shirt bundle $29.99 $22.99 for the CD and T-shirt! What does the T-shirt look like? You can see the design in the image to the left. 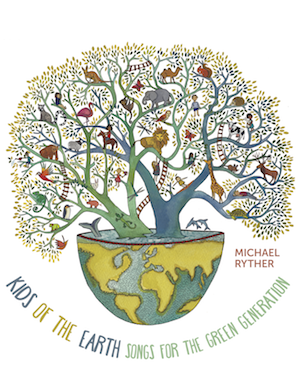 The T-shirt is a variation of the gorgeous artwork on the cover of my latest album, Kids of the Earth – Songs for the Green Generation. This artwork was created specifically for my album by the very talented London based artist Melissa Launay. Melissa’s artwork is captivating. Known for her elegant, intricate style, I was especially drawn to her paintings of vases and trees. I also loved the fact that the people in her paintings often were magical magnets for animals, birds, butterflies and the like. She brought both ideas together in a stunningly beautiful way for my album cover. To order your one of a kind “Kids of the Earth” T-shirt or to order the album and t-shirt bundle click the corresponding order button below!